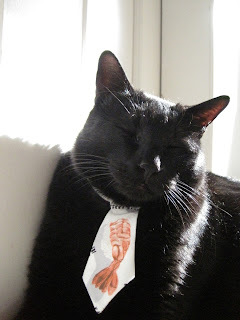 Hats, shirts, bow-ties, and more, I love me a kitty in some GQ fashion accessories. 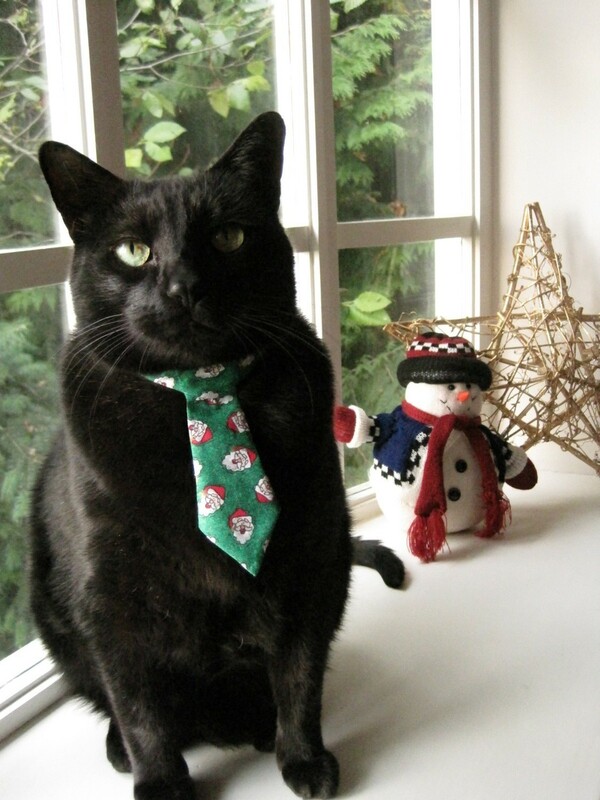 My latest find is Knots & Knives, a kitty tie shop based out of Vancouver. I recently spoke with Knots & Knives creator, Jane, about what gave her the idea to make tiny tabby ties. She also dished to me about Salvador, her gorgeous black spokes-cat who went from a "last call" shelter case to Feline Vogue Homme supermodel. 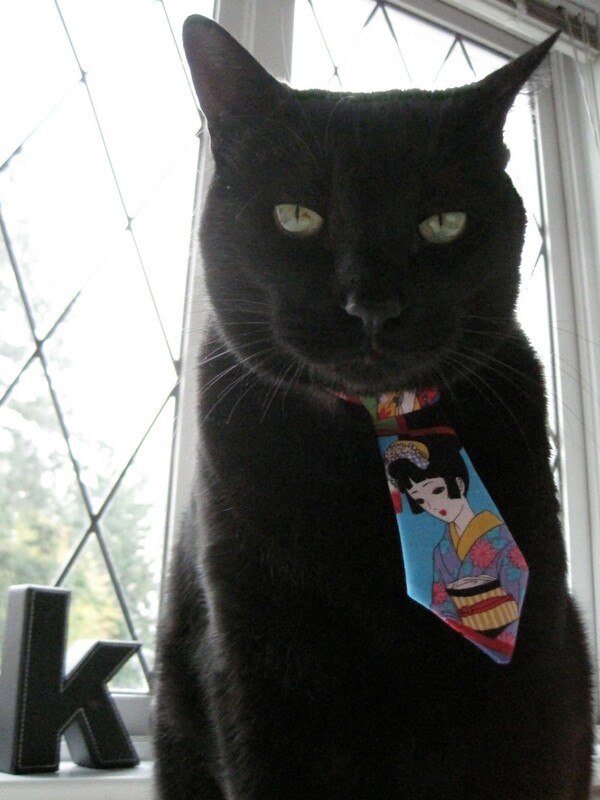 What was the inspiration behind creating a line of ties for cats? Well, I'd have to admit that procrastination and distraction were the driving factors behind my dabbling in the feline accessory world! I work as an assistant designer for a local clothing company in Vancouver, and have been trying to work on my own line in my spare time. My cat Salvador often comes and "helps," ie. lies down in the middle of whatever pattern I'm drafting or whatever fabric I'm cutting. Earlier this year I draped a scrap of fabric around him and tied it in the front so that it looked like he had a little cape. I laughed so hard at how he looked like such a nonchalant little superhero walking around the house! He didn't mind the light weight of the fabric, unlike the devil wings I tried to put on him a couple of Halloweens prior. I started to think about what other lightweight, collar-style pieces I could make that wouldn't bother him, and the necktie was one of the first ideas. I whipped up a little prototype, and off he went! I got such a great reaction from friends and family; everyone thought Salvador looked like such a funny little gentleman. Eventually everyone kept telling me I should make more to sell, so I decided to try a few in an Etsy store last month. To be honest, I didn't even expect to sell one, let alone have them take off like they have! Clearly I owe all of that to my top model Salvador, who makes everything look so cute! 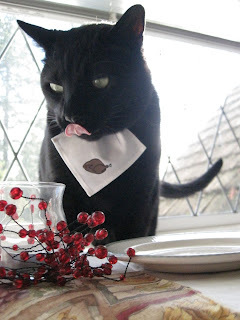 I have many more ideas to pump out into cat accessories; the latest is the little tucked-in table napkin, it's just beyond hilarious when he sits at the dinner table with it on! Next up is something special for New Year's, but you'll have to wait and see! Please tell us more about Salvador, your fabulous kitty model! Salvador came into our lives in 2006, after my mom saw what I can only describe as a "last-call" plea on Craigslist from a shelter over an hour away from where we live. 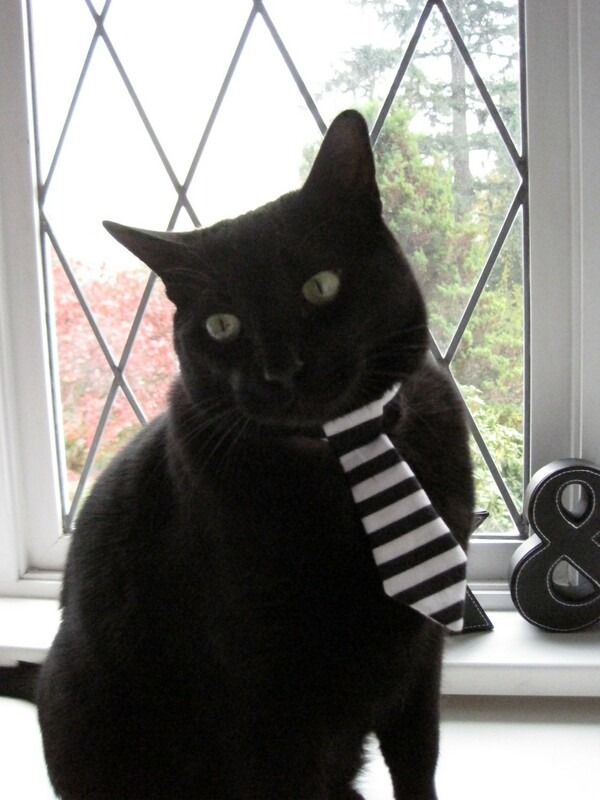 Besides the fact that black cats are the least often adopted, Salvador had already been waiting for months. I had been recently introduced to the cat world by my best friend, who had rescued a stray kitten she saw surviving on bugs and chemical runoff water in a commercial cucumber greenhouse... but that's a whole different story! We had never even owned a cat before, (full disclosure: I had spent most of my life saying I hated cats!) but we watched a video posted by the shelter, and were sold. He just turned ten years old last month! If cats have personalities, Salvador has a personality and a half! It was a very rough road at first; he trusted no one, and would lash out at anyone who came too close. I'd say that for at least a year, even trying to pet him would be dangerous territory. We sustained many injuries, including a great one on a Thanksgiving Day where I was nearly blinded in my left eye! But we stuck with the love, and now Salvador likes nothing more than to have a big old cuddle session, dish out the headbutts by the dozen, or curl up right next to you on your bed. He'll hold a long conversation (must be that Siamese they say is in him) or even stand in the hall and say, "Hurrow! Hurrrrowww!" if he can't find anyone to hang out with. He loves tearing through the house playing fetch (elastic hairbands are among his favourites) and bringing little balls to drop at your feet. He joins us every night to watch us eat dinner from his very own seat at the table... where perhaps he has been known to get a little morsel of fish! He has definitely made himself the little epicenter of our family, and we all adore him. What is Salvador's favorite tie to wear? 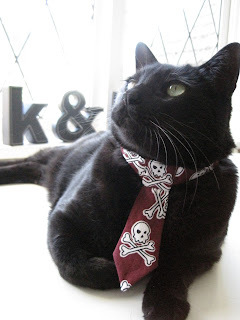 From what I can tell, Salvador likes wearing any of the skull and crossbones ties the best. "Bad To The Bone" has sort of become his own personal theme song when he's strutting through the house! Very special thanks to Jane and Salvador for taking the time to answer my questions! Please stop by their Etsy shop to check out tons of other tie styles, including several seasonal designs such as The T-Day Feast, Jinglecat, A Country Christmas, and more! Thanks for this great post! I really enjoyed reading it ans of course, looking at the great photos of Salvador! What a lucky kitty with such a big personality! Love how loved he is! Loving lots of things! You're welcome! He's definitely a well-loved cutie-pie, and I was very excited to share his great story! I soooo love those ties and have to get one for Cody!